Canadian data has been strong lately and today BoC Interest Rate Decision and BoC Monetary Policy Report will be published. The US will also release EIA Crude Oil Stocks Change. 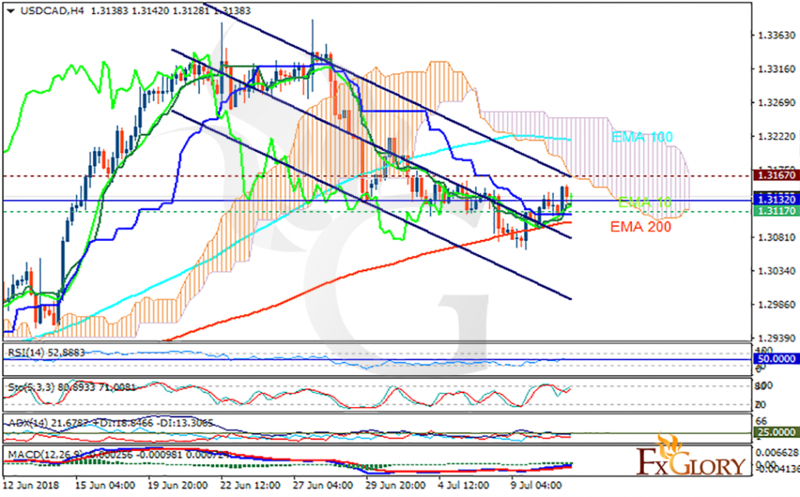 The pair is finding support at 1.31170 with resistance at 1.31670 which the weekly pivot point at 1.31320 is located in between the lines. The EMA of 10 is moving with bullish bias in the descendant channel and it is located above the EMA of 200 and below the EMA of 100. The RSI is moving above the 50 level, the MACD line is above the signal line in the positive territory and the Stochastic is showing upwards momentum. The ADX is not showing any clear signals. The price is in the Ichimoku Cloud and above the Chinkou Span. The Tenkan-sen and the Kijun-sen are both showing a horizontal trend. USDCAD will probably rise towards 1.318.